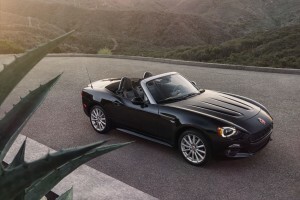 The Fiat 124 Spider, will arrive in New Zealand at the end of the year just in time for summer. Its most powerful Abarth version has been launched in the USA with two new videos, “Free Like a Bird” and “No Blue Pill Needed, on Fiat’s YouTube, Twitter and Facebook channels, with additional content across its digital and social channels, including Instagram. Free Like A Bird | 2017 FIAT 124 Spider | Feat. 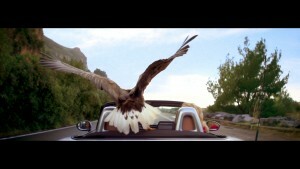 Wyclef Jean: In an automotive first, the FIAT brand reaches new heights with “Free Like a Bird,” which was filmed by an eagle-in-flight through the mountains of Palinuro, Italy. The 1:22-minute video, with song “Free Like a Bird” feat. Wyclef Jean lives on the FIAT brand’s YouTube channel, in addition to content across Facebook, Twitter, and Instagram (#FreeLikeABird). The spot begins with a bird’s-eye view of a couple traveling through the Italian mountains in an all-new 2017 Fiat 124 Spider. With a subtle nod to the car model’s heritage, a classic 1967 roadster passes by the all-new 2017 Fiat 124 Spider, before revealing the bird’s-eye footage is being filmed by an eagle. The Fiat proudly worked closely with FREEDOM, a conservation movement that supports and protects threatened birds of prey, to help create the first commercial co-directed by eagles. Three white-tailed eagles – Roi, Victor, and Fletcher – participated in the two-day production. A tiny Sony Action Cam camera, weighing less than 2.8 ounces (80 grams), was placed onto each eagle. The eagles are residents of FREEDOM, whose mission is to protect and reintroduce the endangered birds into their natural habitat and promote the awareness of endangered birds. The eagles featured in the video are currently dependent on falconer Jacques Olivier Travers, who is working to reintroduce them into their natural habitat. Travers works to introduce endangered birds into a natural habitat and promote the awareness of the plight of the endangered birds of prey. Travers and the white-tailed eagles reside in France, 30 minutes from Geneva, Switzerland. The FREEDOM Conservation has trained eagles for video productions all over the world, from the French Alps to Dubai. More footage from the FREEDOM Conservation can be found here. The spot was created by Fiat in partnership with FCB Chicago. “No Blue Pill Needed”: After finding his bottle of blue pills empty, an elderly gentleman (Nini Salerno and Adele Pandolfi reprising their roles from “Blue Pill,”) spies the all-new 2017 Fiat 124 Spider outside his window and uses it to race away to get more. Along the drive, set to the music “Papa Loves Mambo,” he discovers that his pills are no longer needed. He returns home to his wife and proudly announces that “we’re back” – a nod to the Fiat 124 Spider’s return. Supplementary social content will be posted across the Fiat social channels with the hashtag #NoBluePillNeeded. “No Blue Pill Needed” is a follow-up to the Fiat’s award-winning “Blue Pill” spot featured during the 2015 Super Bowl telecast. The 60-second spot follows the epic journey of “The Fiat 500X Blue Pill” as it slips through the fingers of an amorous Italian, skipping across rooftops, down a drain pipe, bouncing off villa walls, pinging across café tables and eventually dropping into the open fuel tank of a Fiat 500. Given “The Fiat 500X Blue Pill,” the vehicle becomes a “bigger, more powerful and ready for action” 2016 Fiat 500X crossover.